Creating and developing architectural concepts is something a lot of students and indeed many architects struggle with. This may be due to project pressures, writers block, limited inspiration, or just the fact that for many students their architecture schools particularly in the first couple of years, don’t teach and stress the importance of them. As we discuss here in “How to develop an architecture concept”, the best conceptual approaches should always aim to provide the backbone and foundation to a new project, and form part of the initial process as much as your site analysis should do. Here we provide a list of 21 concept ideas that can be used as starting points for your conceptual development and help steer you in the right direction as your project develops. Note though, that to create a meaningful approach these listed ideas must be tied back to your own thought processes, interpretations and analysis, in order for them to be bespoke to your project …there is not a one size fits all. Following each description we provide a Pinterest link to a list of examples that demonstrate how each concept can be used in a real world scenario, or how it can be explained through concept sketches and models. The typography of your site can be used to develop many different conceptual approaches such as the environment the building provides (shelter / exposure), its structural approach (cantilevering / subterranean), how it is perceived (public / private), and how it utilises its context (views / features). For example, a steep site calls for a strong structural concept from the outset, whereas a flat site may want to address its exposure and how the building interacts with its north, east, south and west facing aspects. Buildings need to relate to their context and if your site has a moderate to strong vernacular, then based on the research from your site analysis; this can be used to your advantage during your conceptual development. 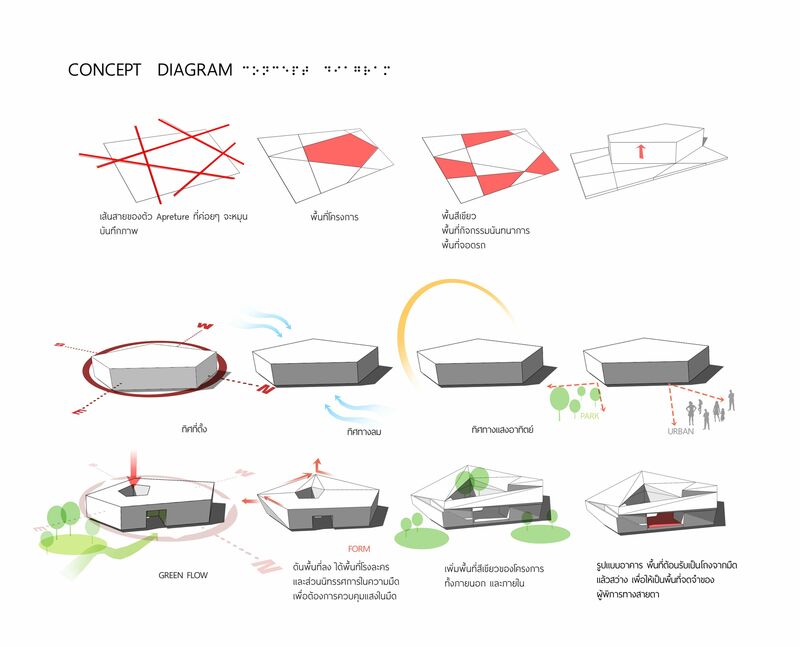 For example a strong pitched roof typology, can lead to study of how to adapt and push its form forward. Take The Dune House by Norwegian Architects Jarmund/Vigsnæs, one simple sketch quickly explains their concept and demonstrates how it is rooted back to the site. You may want to start with a simple form and volume study, where you can experiment and study into how to manipulate positive and negative spaces. An excellent set of books that explains this very method is the Spacial verbs series listed here and featured at the end of this article. It’s worth noting however that this method will not be enough to successfully create and ground a meaningful architectural proposal, and should be accompanied with at least one other approach. Using the historical research of your site and its surrounding context can open many types of various avenues to use and explore. Every site has a history and quite often a story to tell that perhaps leads into an investigation into how to modernise past construction techniques or how a new housing project should be master planned based its towns original plan. Connecting and using past influences and methods will severely strengthen your conceptual approach. Physical features generally refers to the site elements, such as water bodies, trees, vegetation, rock formations, manmade structures etc. Take 6a’s architects “tree House’ project that uses the sites natural elements (in this instance a tree) to inform and shape the proposed building, or Carmody Groakes Burgh Island house and Adalberto Libera’s Casa Malaparte that both use their sites coastal cliffs to support themselves. Utilising the views from your site can help to define and shape your building in levels of importance and priority. Key spaces will want to take advantage of them and utilitarian areas should be set aside. Equally, if your site does not have views out, then you will need to create views in, and start to build a concept based on internal views. Where there are views however you may also want to draw site lines out and across your site to create a lattice like diagram that may lead to the grid concept described below, or simply further exploration. Additionally, your concept could be based around how and where the views are revealed, and how your building opens up to them. Through your site analysis you should be able to quickly establish were the public and private areas are, and depending on the building type and the nature of your context, establishing this concept early on can be a great project driver. For example in an urban context, the private spaces may need to provide a complete detachment from its soundings to create its own micro environment. However within a rural setting the private spaces could still have a strong connection to their surroundings but be set away from the public areas. Taking the design briefs specified accommodation and mapping it out to represent separate squares and rectangles to the required floor areas, can help to develop and visualise the spaces that should be connected, separated or be within close proximity to one another. This is very similar to the above, where the arrangement of your buildings spaces and accommodation are based purely on their category, and how the user will interact within that space as they enter and move through it. Supermarkets for example are purely based on this strategy where the fruit and vegetables are always found at the front of the store. This is a conscious decision to provide your brain with the impression that you’re entering a natural and fresh environment …a pleasant oasis apart from the rest of your working day, this then sets you upon your journey throughout the rest of the store. The same can be said for museums and art galleries where the user is purposely guided through the building and exhibition spaces. Using massing to form a conceptual approach is essentially taking the planned areas you may have created for an accommodation study and extruding them into 3D forms for arrangement. This masterplan proposal by Swedish architects Jagnefalt Milton for Åndalsnes in Norway, is a really good example of using journey and movement to create a concept. Through site analyse, current, old and disused train tracks were used as a foundation to create this sustainable response, where the sizes and weight limitations of the tracks went onto also help create the living pods\carriages. For this method you need to start off with a solid volume that exceeds the requirements set out by the design brief but also sits comfortably within the given site. Elements of this mass are then removed and shaped according to site factors, design brief requirements, accommodation placements etc. The type of materials you propose can be used to form the foundation of a design concept by utilising their properties in terms of their type, size and limitations. For example a two story building, may have a stone or masonry base, and then a lighter material could be used to form the second floor, say timber. The conceptual strategy is a light object sitting upon a heavy one, the properties of the materials dictate this arrangement, as it would not work the opposite way around. Similarly the material choices may be a play on the local vernacular of your site, or the construction techniques originally used. You can investigate how these can be modernised and improved upon. Site grids can be taken and created from almost anything, and for this reason they can be incredibly diverse in their use. The purpose of site grids is to provide strategic and justified areas and separations on what could be a completely blank canvas. Mapping views that pass through or overlook the site, can help to located areas of exposure or desire. Or mapping and pulling through the local street typologies into your site can again divide the site up and provide a grounded take on the local context. This is largely generated from the design brief and the use and occupancy of the proposed building. Take a monastery for example, where the monks living within and using the building follow very strict rules and day to day activities. They live extremely simply with limited possessions, and this instantly starts to map out and define the proposed spaces. There is a lot to be said for really scrutinising your design brief, and breaking it down into its separate parts. Stemming from your site analysis, this works particularly well in exposed areas where the concept plays with open and closed spaces to create different environments and experiences. This can be done by controlling how your building interacts with light, shadow, wind, rain and general weather patterns. Equally this method could tie into a public and private design concept, where the protection and shelter elements form the required divides. Peter Zumphor does this very well and talks about it in both his two books “Atmospheres”(amazon link) and “Thinking Architecture” (amazon link). Playing with atmosphere is about the use and adaption of light, shadow and space to provide the buildings users with the experience of feeling and emotion as they move through and occupy its spaces. Special attention should be made to orientation and seasonal variations of your site, where the light and weather patterns should be mapped in order to assess how they pass through and over the building. Again taken from the design brief and the requirements for the project, Architecture is created for and around people, and so why shouldn’t they be used to create a concept. An infant school for example, needs to provide for very small humans as well as fully grown ones. This often results in single storey zonal planning, with strong connections to the outdoors. Light can used in a number ways to shape, create and define spaces, however with natural light in particular, it can only be used once you have (again) carried out your site analysis. The size, orientation and shape of your site will help to determine how it can help conceptually. For example, a narrow rectangular site may struggle to bring light into its core, and so this opens up the option of creating courtyard spaces. Or there may be a certain period of the day where the light casts a particular ray or shadow, and the massing of your building may want to work with or around this. Again established from your site analysis, the orientation is key factor to consider in every architecture project and using it to help define the conceptual development of a design project, can provide vital information for the siting your building and accommodation within it. Mapping out how the light enters and affects the site will provide key information on how the building can be used and arranged. For example, in the northern hemisphere with the sun rising and setting from east to west, a buildings utilitarian spaces where natural direct light is less important, could be located on its northern side and/or centrally. Equally, this will also assist in the positioning of openings and outside spaces …the orientation will help to map out and organise the programme. Knowing how you wish to build your proposal from the beginning can heavily influence your conceptual development. This can be an investigation into local vernacular methods of construction, through to techniques and technologies that are in the very early stages of development and not yet widely available. Equally, structural features such as a large cantilever or span can also create inspiration, for example London based architects HAL’s design for a suspended swimming pool aptly named “sky pool” calls for a transparent structure free proposal. The proposal itself is simply a glass rectangle, the magic is all in how it is suspended. For further reading, we have a selection of recommend books here that from various perspectives provide a further insight into concept and design development. …and lastly we’d love to hear how you get on with finding and adapting your own architectural concepts, and if you have any questions, please leave them in the comments below.